This week marks 6 months since the rules changed in June 2018 to allow learner drivers to practise driving on the motorway with a driving instructor. A recent study we carried out showed that a lack of motorway experience was the main reason newly qualified drivers didn’t feel prepared for driving independently. The changes help give learner drivers the opportunity to get a broader driving experience before taking their driving test and improve their confidence driving on the motorway unsupervised. Since June, it’s been great to hear positive feedback from you and your pupils letting us know they’ve found having the opportunity to practise with an instructor really useful. In this blog post, guest author Finbar King tells us a bit about his experience driving on the motorway for the first time. Finbar is AA president Edmund King’s son. 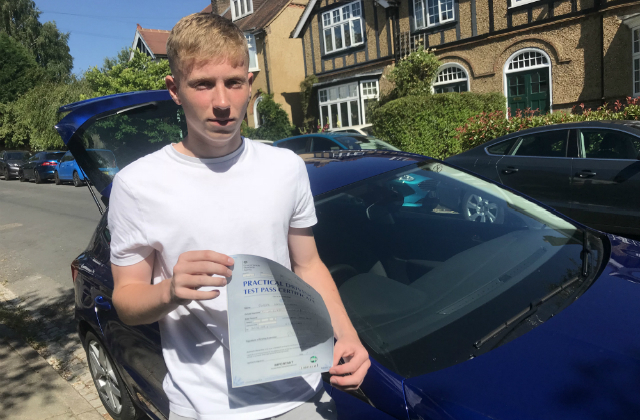 With the new rules coming into force at midnight on 4 June, my dad and driving instructor Mark hatched a plan that involved me driving onto the M25 at seconds past midnight - how exciting! To start with, we did a couple of practice runs up to the large roundabout next to the M25 which we timed. Then, at a couple of minutes to midnight, I set off in my instructor’s car with my dad in the back filming. We decided that depending on the timing I would either do one or two laps of the roundabout while waiting for it to turn midnight. As it happened, one was enough and off I drove to join the M25 seconds after midnight. As it was only a few minutes past midnight, it wasn’t too busy as I joined the motorway. I’d driven on quite a few dual carriageways before so I wasn’t too nervous about joining the fast-moving traffic. I felt like this helped really prepare me for motorway driving. My first drive went really well, although my instructor did have to tell me to slow down as my speed began creeping up at one point. My dad then sent some of the coverage to a journalist and pretty soon the whole video and photos appeared on the This is Money website, which was pretty surreal. Following the success of my first motorway drive in the early hours of the morning, we met a film crew from ITV’s Good Morning Britain who wanted to film me live on the motorway. They set up cameras on the windscreen and the reporter squeezed in the back. I was glad that my dad told them not to interview me while driving, as it was quite a nerve-wracking experience! This time it was M25 rush-hour with many more trucks and cars - the normal heavy Monday morning traffic! I felt I did OK, but I’m glad I’d experienced the drive with just my instructor first. Some of my schoolmates told me later that the presenter Piers Morgan had said I looked scared and this was an accident waiting to happen. But what does he know? My instructor Mark definitely made sure I had enough practice before we even thought about driving on the motorway. I think the change in the rules for learner drivers is a really good idea and I think that every learner should have at least one motorway lesson before driving on the motorway unsupervised. Great post! I think this legislation was an excellent idea, and it was great to read about a learner's experience. I couldn't disagree more with Morgan's comment. Its not the learner drivers we need ti worry about! Its the so called "experienced" mad men needs training! any experience or even better compared with inexperienced and stupid learners causing huge problems in rush hours and possible a cause of an a accident awaiting to happen. That being said. Good luck out there. Well said John. My sentiments exactly. Especially when these idiots take no heed of the conditions such as fog and rain.Also I would like the phone nutters to be taken off the road for life.Is that call that important that it can cause accidents. I think not. An excellent change in the driving experience regulations & so relevant to get Motorway experience of both night & day driving. As an octogenerian driver My recommendation is to treat every motorway driving experience as your initial one & don’t just assume familiarity of the road circumstances! Be alert always to poor & dangerous driving around you & make sure you can deal with it. How are the learner drivers in Aberdeen and Inverness doing with the motorway lessons ? I think that the Driving Test should be a two tier test with the first part existing as it is, without any motorway involvement, and the second part being taken after one years experience with a full licence. Part two would be a retest to make sure bad habits had not developed in non-motorway driving followed by the motorway test. This second part should be available to all existing full licence holders so they can demonstrate to insurance companies their level of liability. I have a feeling that this is going to be unpopular! It was a great idea to allow learners on the Motorway network. Now the standard of driving on these roads will improve. ALL of my learners now drive a 2 hour lesson before taking their test on the Motorway so that I have better prepared them for "post test driving"